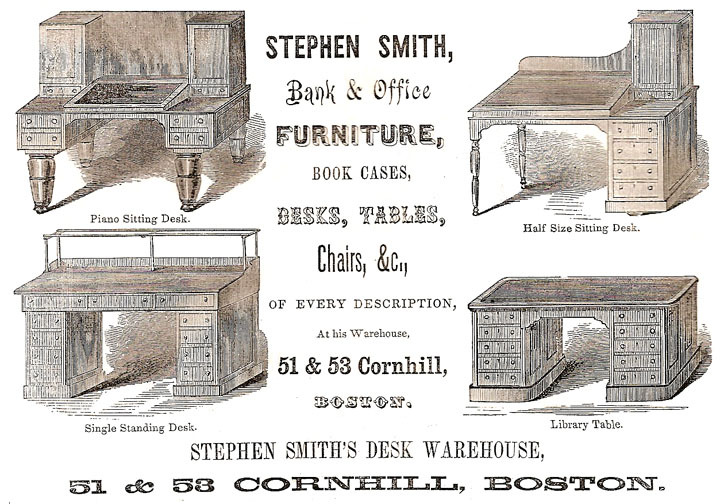 Four styles of desks, Stephen Smith's Desk Warehouse, Boston, MA, 1854 ad. J.W. Schermerhorn & Co., NY, NY, 1869. H. Mott & Co., 1873 billhead. 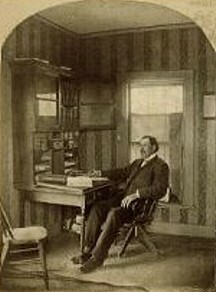 Lawyer in Office, Minnesota, 1882. 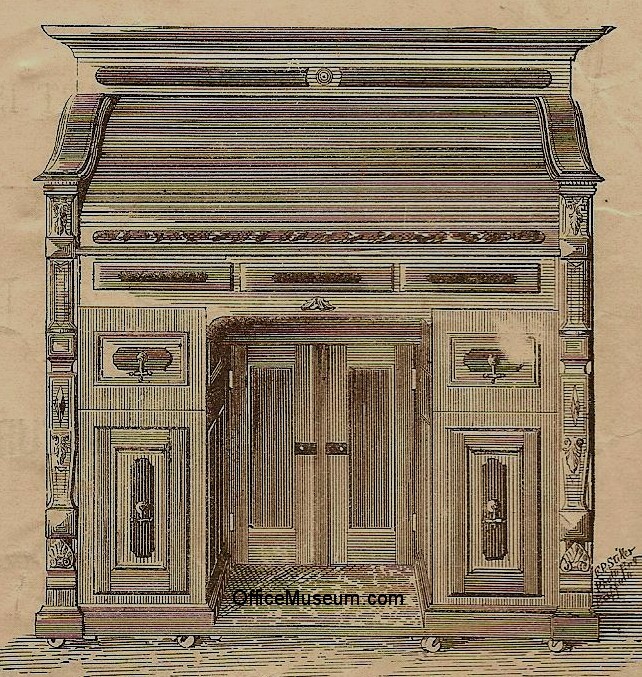 Because a desk of this style appears in a c.1856 photograph of a Western Union office, one can infer that this style was introduced by c. 1856 or, alternatively, that the photo in question is not correctly dated.. 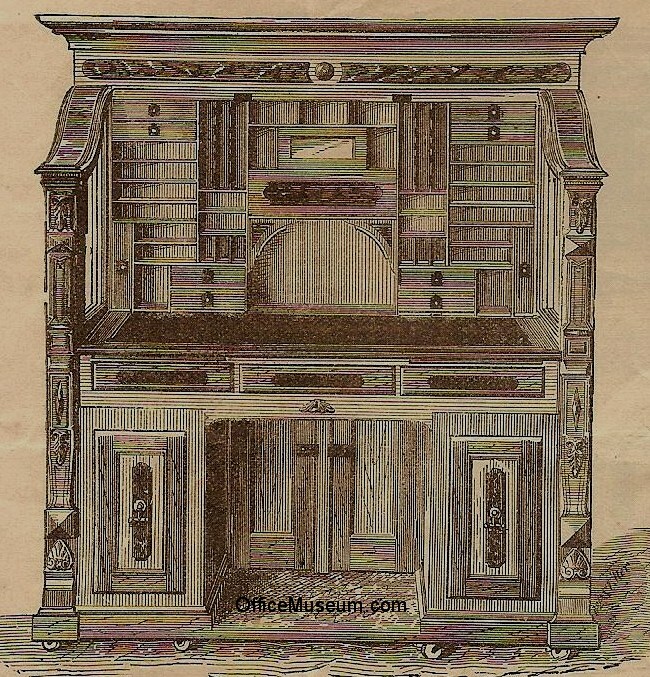 Desks of this style were advertised in 1873 (Kehr, Kellner & Co., Designs of Writing Desks, New York, NY) and c. 1882 (T. B. Wigfall, Chicago) (both Hagley Museum and Library). 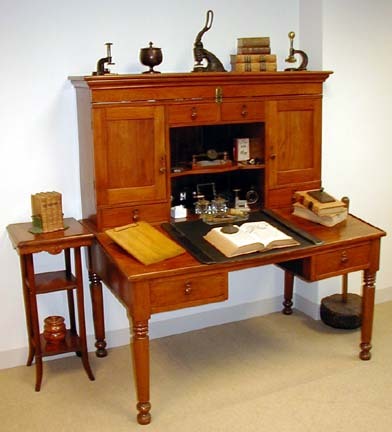 Cylinder Desks: There is a distinction between cylinder desks and roll-top desks (a.k.a. 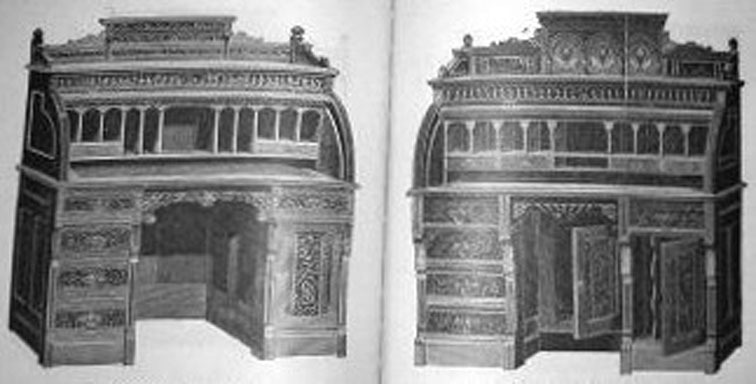 curtain desks). On cylinder desks, the top that swings into place to cover the writing surface is not flexible, and the track is therefore a circular arc. On roll-top desks, the top that rolls into place is flexible, and the track typically has an S shape, although in some cases it is a circular arc. 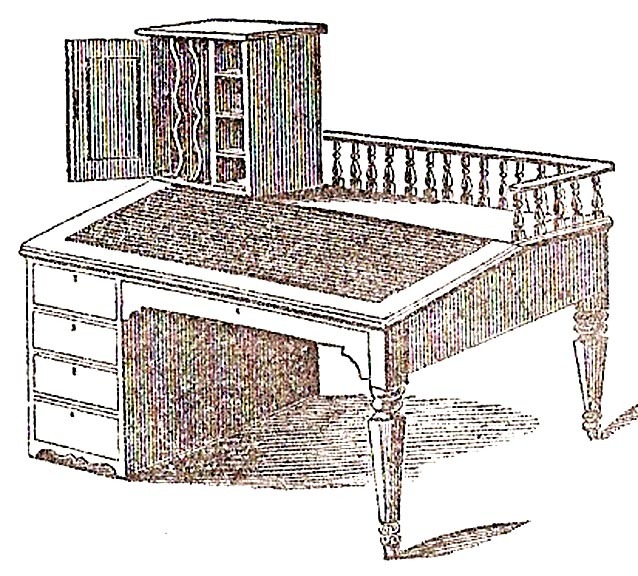 P. Talbott states that roll-top desks were introduced in the US in the 1870s, and that "by the 1870s the most commonly illustrated desk was the cylinder, or roll top, desk." 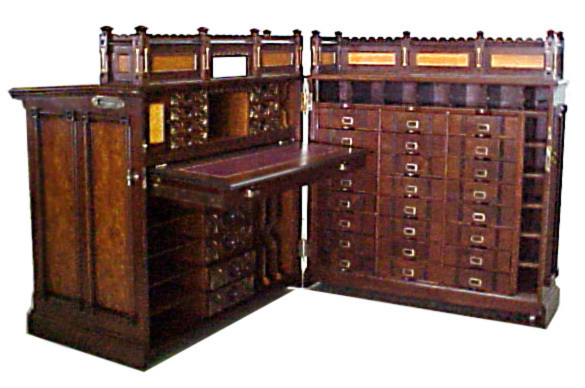 ("The Office in the 19th Century," in J.C. Showalter & J. Driesbach, eds., Wooton Patent Desks, 1983, pp. 15, 18.) 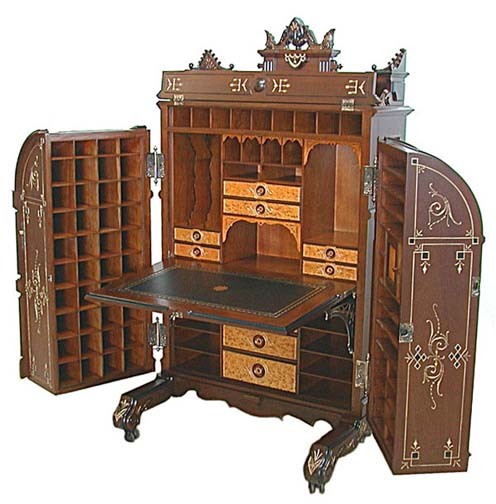 Talbott's references to roll-top desks must be references to cylinder desks. 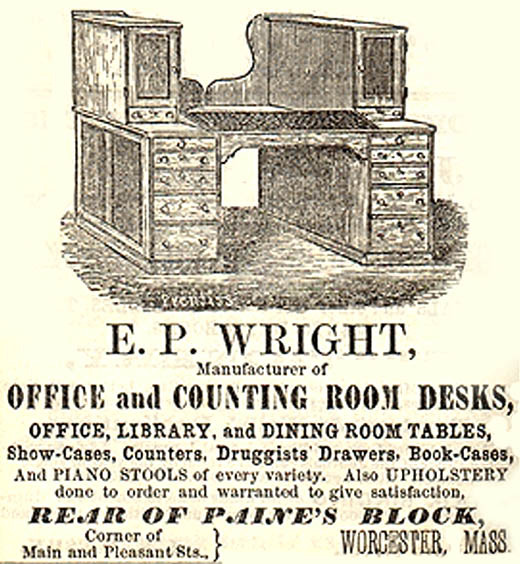 The earliest ad we have seen for cylinder desks dates from 1871 (immediately to left). 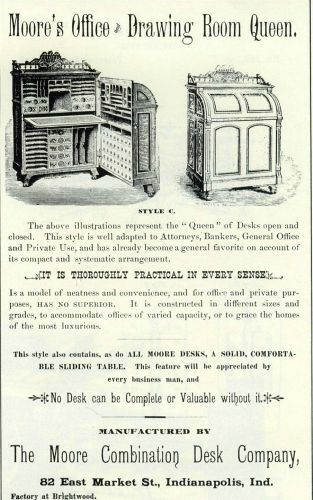 Cylinder desks were advertised in the US in 1873 & 1876 (Kehr, Kellner & Co.) and continued to be advertised in the early 1880s. 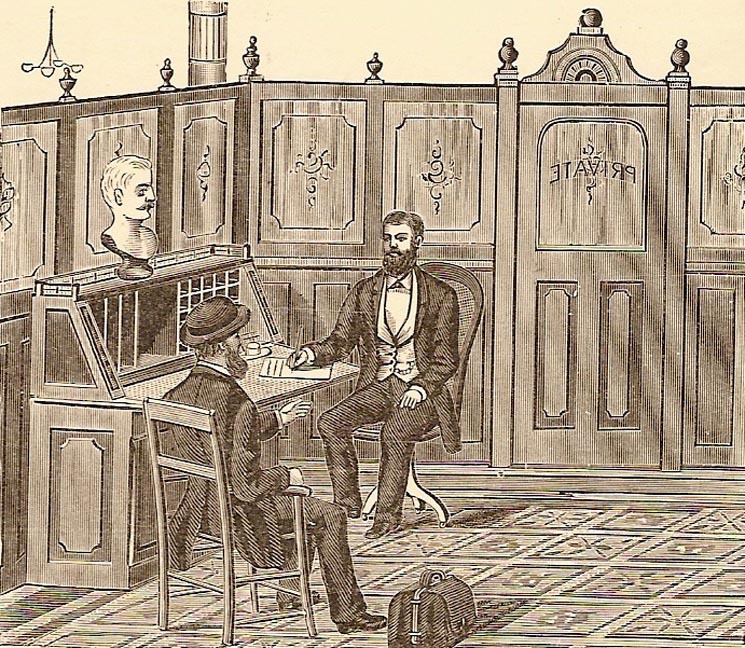 The earliest illustrations we have seen of offices with cylinder desks date from 1874 (far right) and 1876. 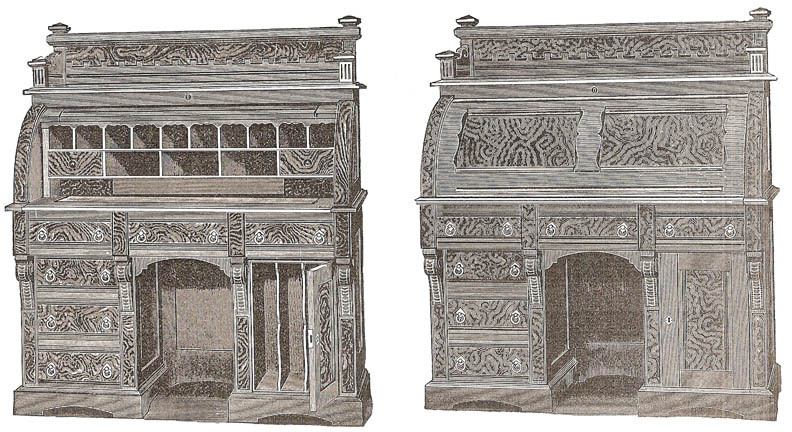 Mark Bridge (p. 42) reports that what may have been the first cylinder desk was built for Louis XV during 1760-69. 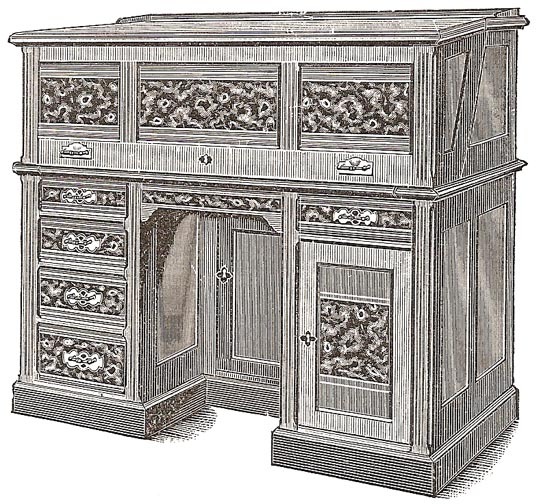 Cylinder desks were popular in France for at least the following century. 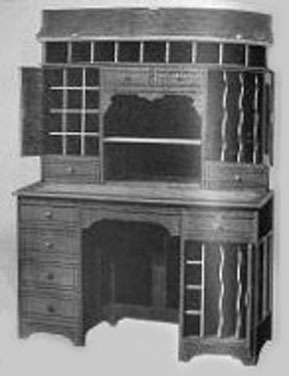 A c. 1776 French cylinder desk is on display at the National Gallery of Art, Washington, DC. Bridge (pp. 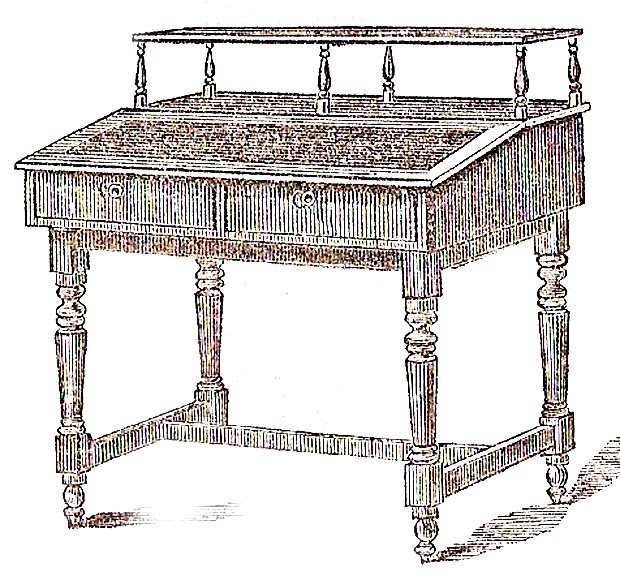 70-71) indicates that tambour, or roll-top, writing tables with drawers and pigeonholes existed in England by 1788, but these were much smaller than the roll-top desks that were popular in the U.S. a century later. "Sudden Death of the Hon. 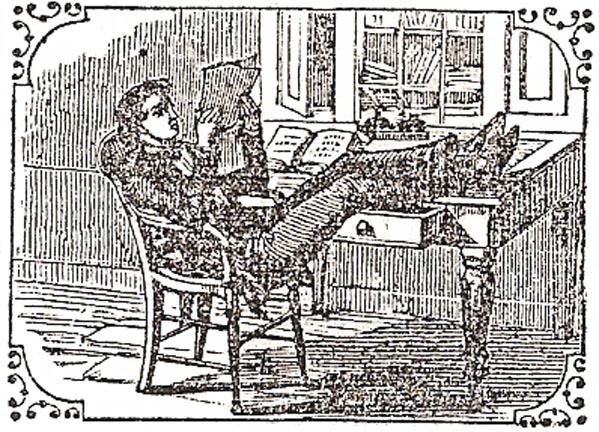 William F. Havemeyer in his Office," New York, NY, Frank Leslie's Illustrated Newspaper, Dec. 1874. Havemeyer (b.1804) was mayor of NYC during 1848-49 and died on Nov. 30, 1874. 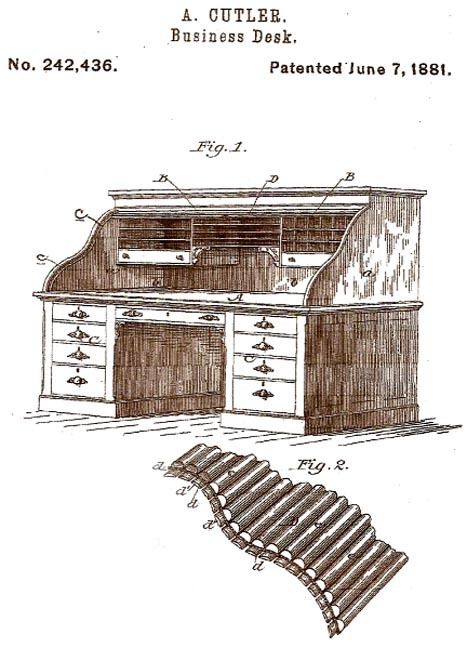 Fred C. Cutler: In 1875, Fred H. Cutler, of Buffalo, NY, was awarded a patent for a desk with a flexible top that pulled up rather than down (see patent illustration immediately to right). 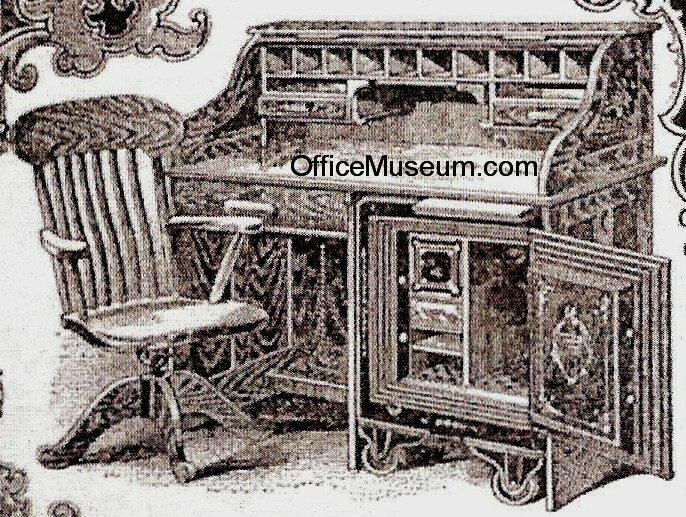 We do not know whether this design was manufactured, but it appears to be a predecessor of a roll-top desk. Notice that Fred H. Cutler, D.L. Ransom & Co. (see row immediately below), and Abner Cutler (two rows below) were all in Buffalo, NY. 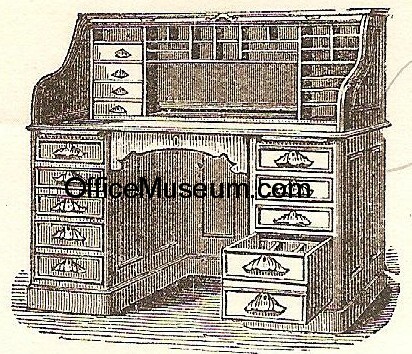 Ransom Desks: In 1876, D. L. Ransom & Co., Buffalo, NY, advertised large office desks with flexible pull-down tops. 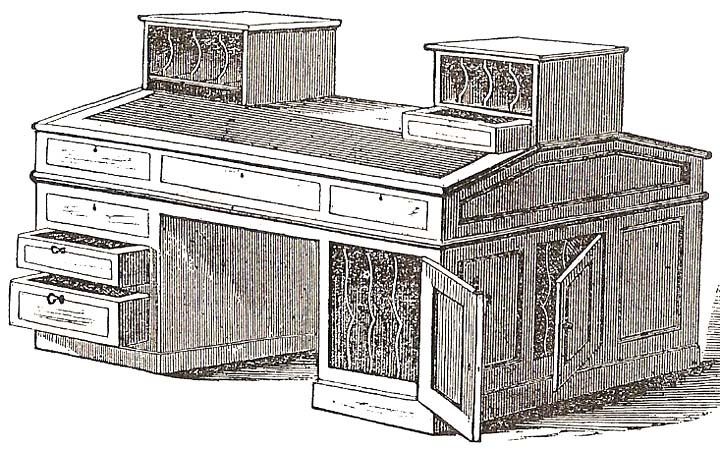 These desks were exhibited at the 1876 Centennial Exposition. 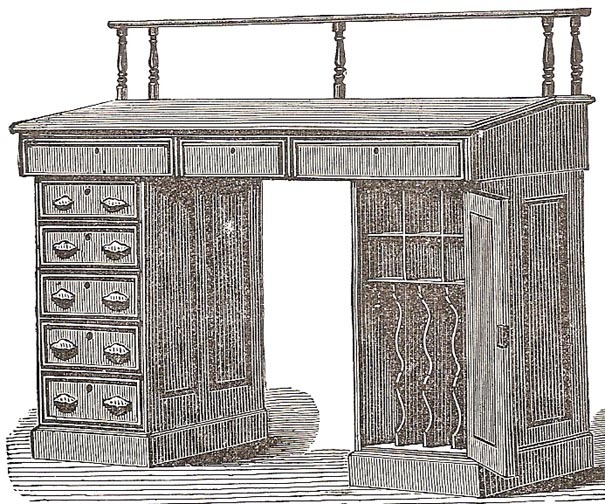 Arguably these were roll-top desks, although the word "roll-top" was not used to describe them. At a minimum, they were precursors of the roll-top desk. The writing surface was at a height suitable for a sitting person. The writing surface was at a height suitable for a standing person. 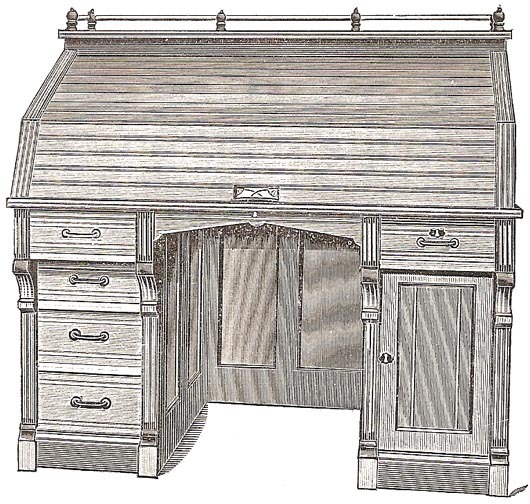 Roll-top Desks: The earliest illustration and use of the term "roll top desk" that we have found are on the 1880 billhead below. 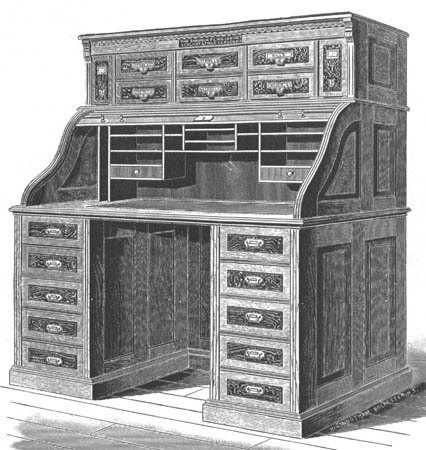 The term "roll top desk" appears in the handwritten line. 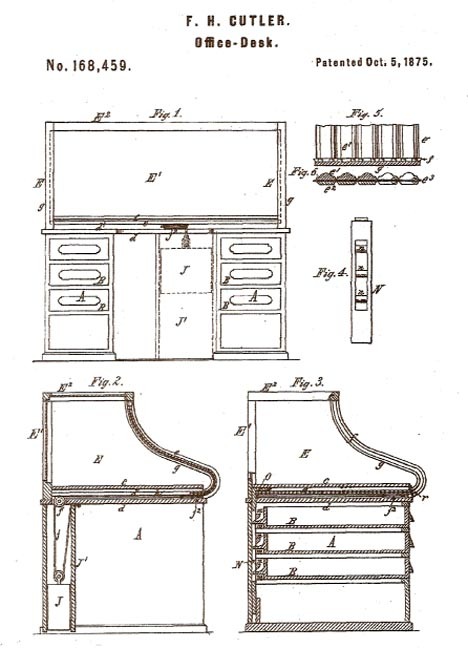 Patent illustration for a roll-top desk, Abner Cutler, Buffalo, NY, 1881. 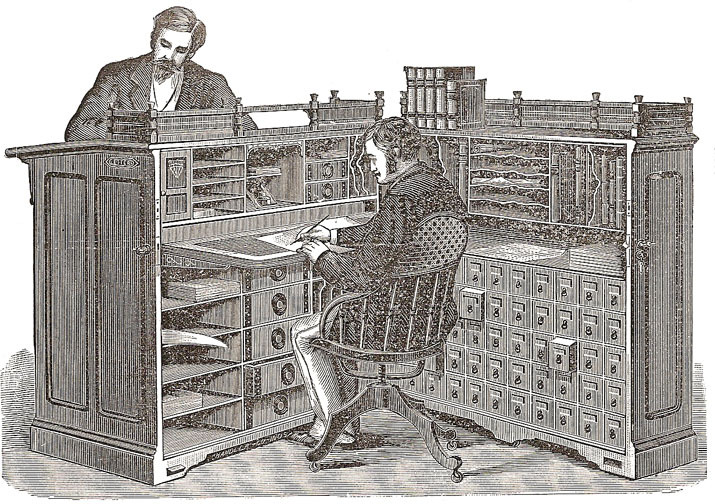 In 1881, Abner Cutler of Buffalo, NY, presumably a relative of Fred H. Cutler (see two rows above), was awarded the earliest patent we have found for a true roll-top desk (although the patent did not use the term "roll-top"). 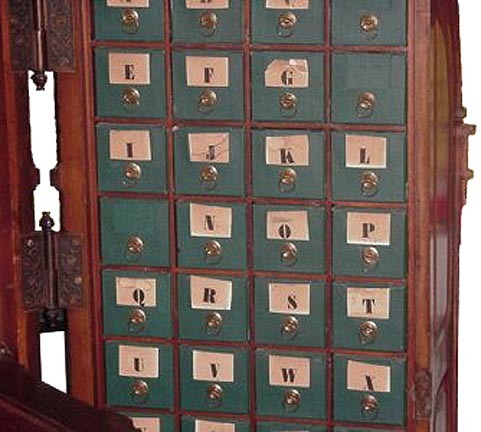 Abner Cutler filed the application for this patent in 1880. 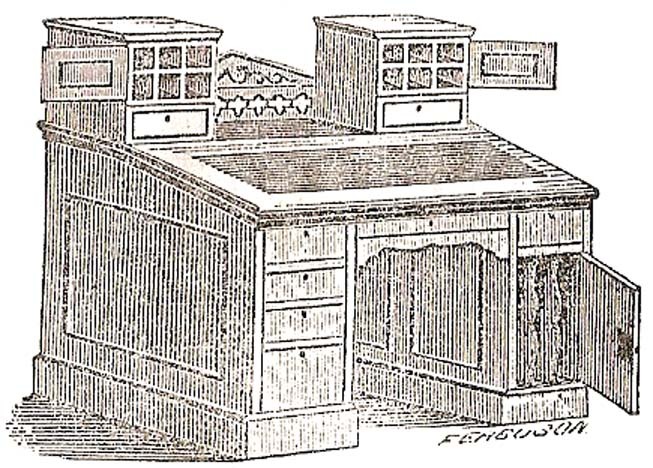 Roll-top Secretary Desk, Geo. H. Derby & Co., Boston, MA, 1884 ad. 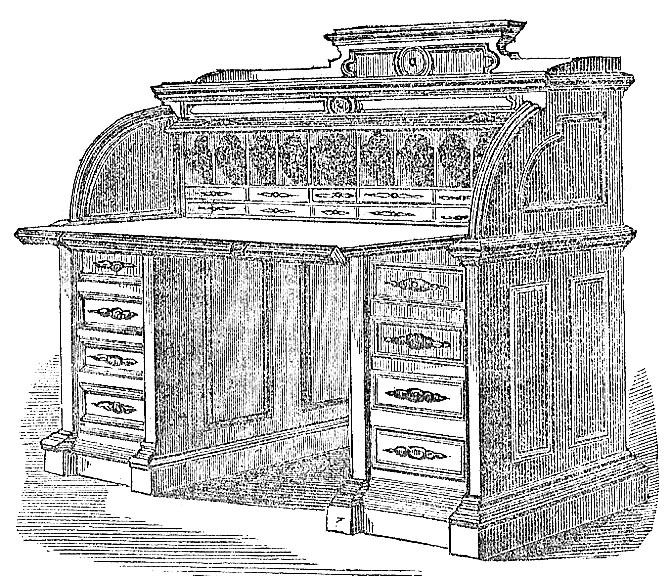 "The Fifth Illustrated Catalogue of the Derby Roll-Top Desks," published in 1884, stated that "Thousands of Derby Roll-Top Desks are now in use." 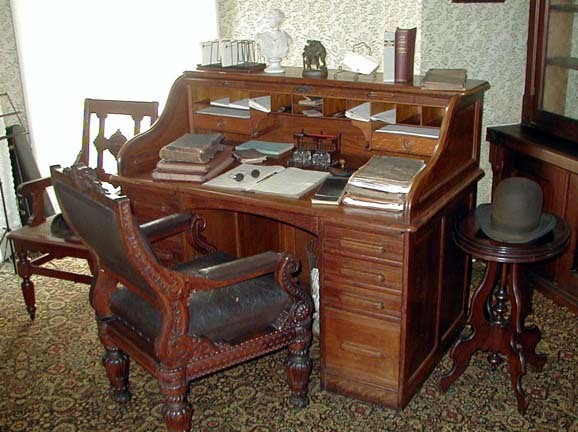 This suggests that production of Derby Roll-Top Desks may have begun c. 1880. 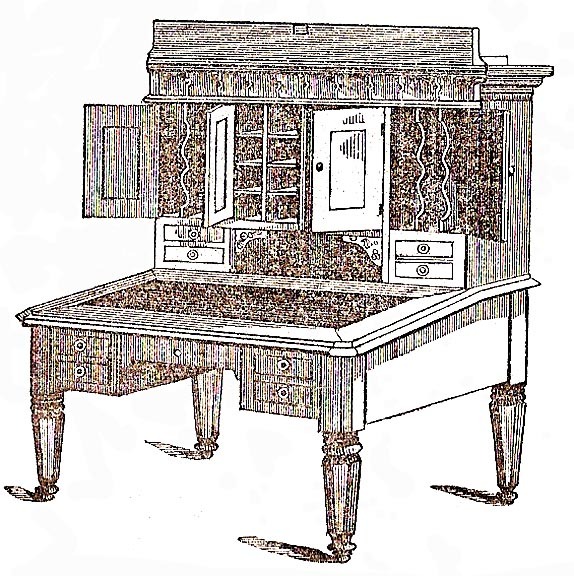 The earliest use of the term "roll-top desk" that we have found was in 1881. 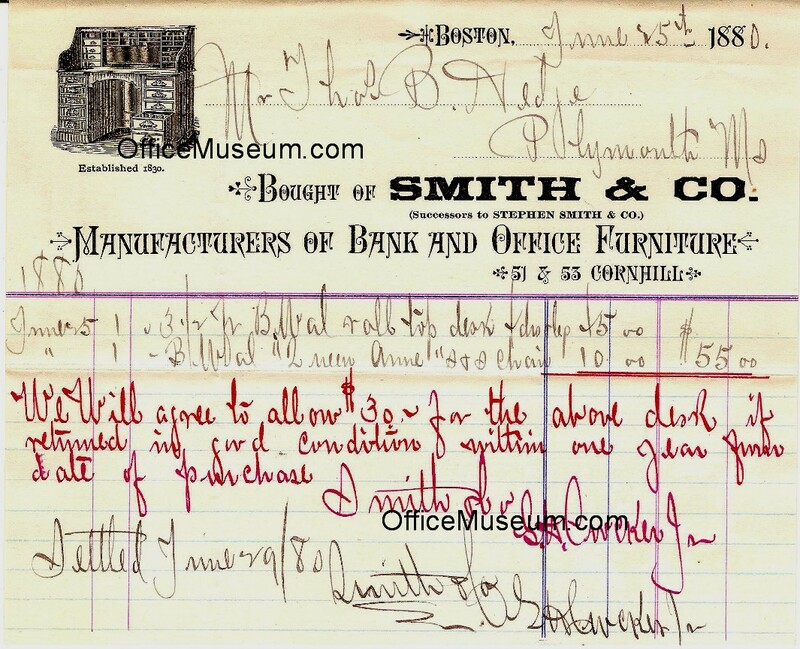 The catalog for the Fourteenth Exhibition of the Massachusetts Charitable Mechanic Association, Boston, MA, 1881, p. 98, states that Smith & Co., Boston, MA, exhibited a "Roll-Top Desk." 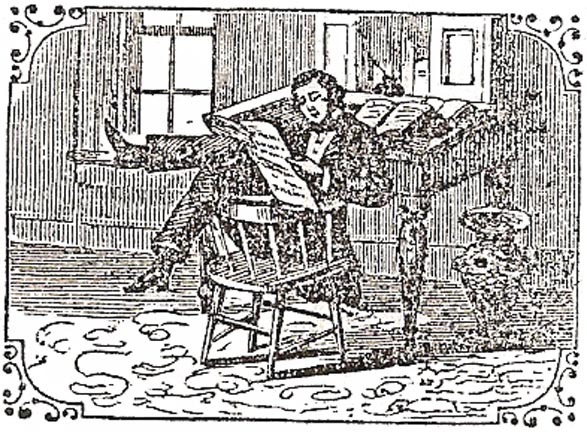 The Literary World, Oct. 22, 1881, p. 370, states that "...a publishing house does not necessarily consist in frescoed ceilings, black walnut counters, roll-top desks, and Brussels carpets." 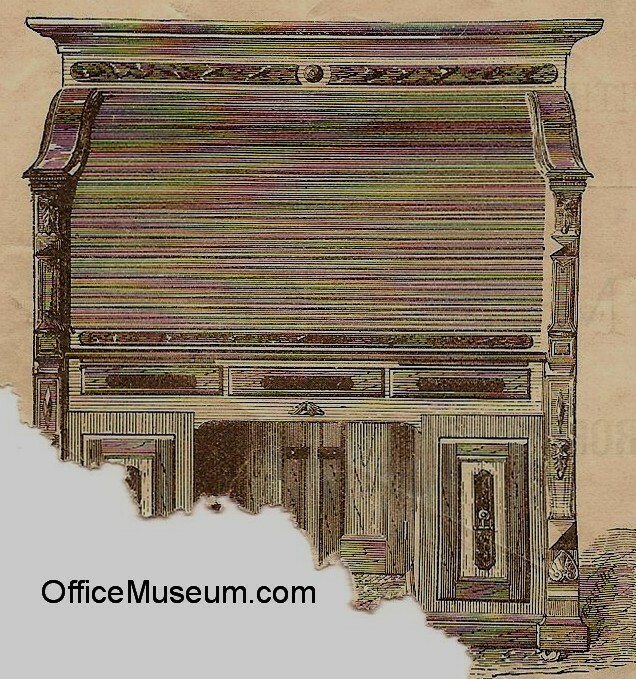 The earliest advertisement we have found for a roll-top desk was published in 1884; we have found 1884 advertisements for roll-top desks made by numerous companies. 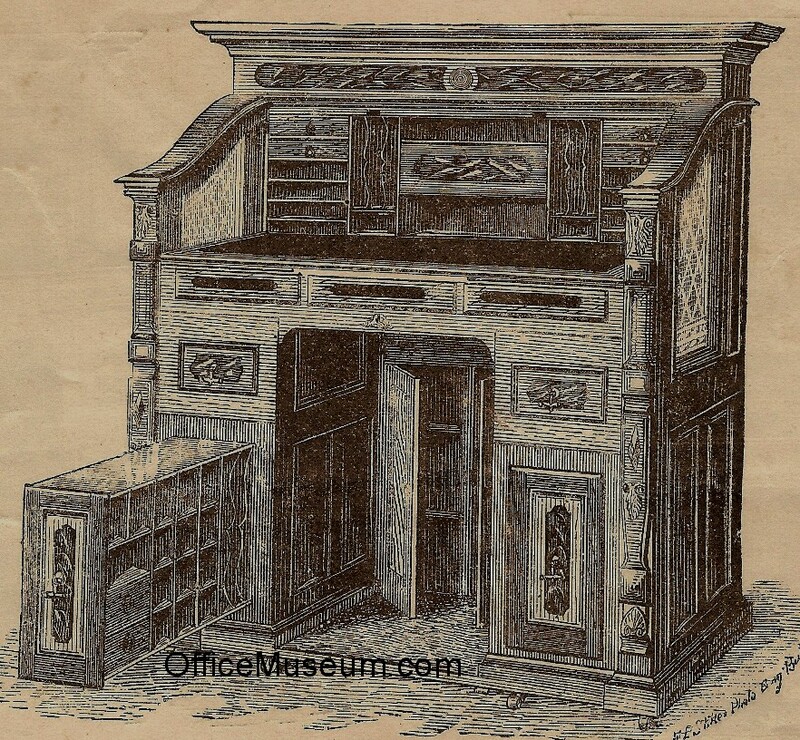 The earliest illustration we have seen of an office with a roll-top desk dates from 1887. 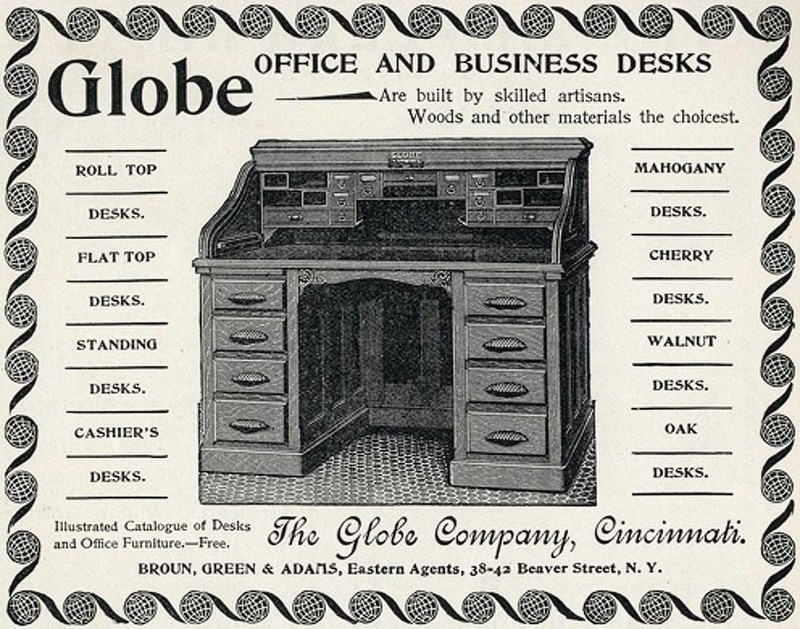 Roll Top Desk, High Roll, Extra Grade, The Globe Co., Cincinnati, OH, 1894/95 catalog. 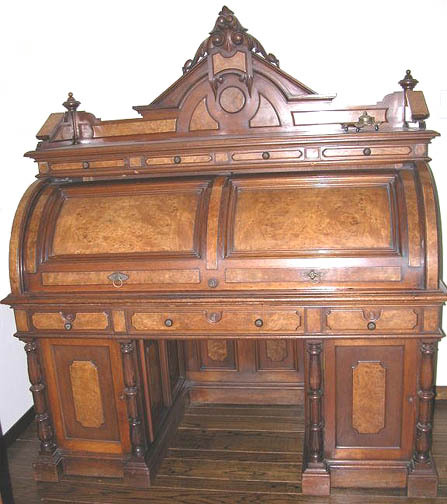 At $100 in oak or walnut or $125, this was close to the top end of the roll top desks in the catalog. 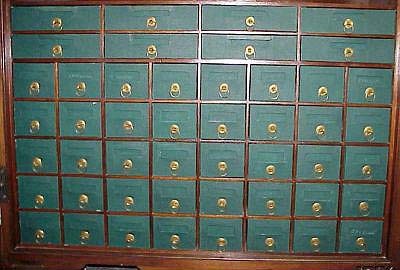 Filing Cabinets for the Tops of Desks: Manufacturers marketed filing units that were designed to be placed on top of flat and roll-top desks. National Office Furniture, M.J. Wise, Sole Proprietor, Washington, DC, 1884 catalog. Wells' Cabinet Letter File, Wells Mfg. Co., Syracuse, NY, 1893 ad. 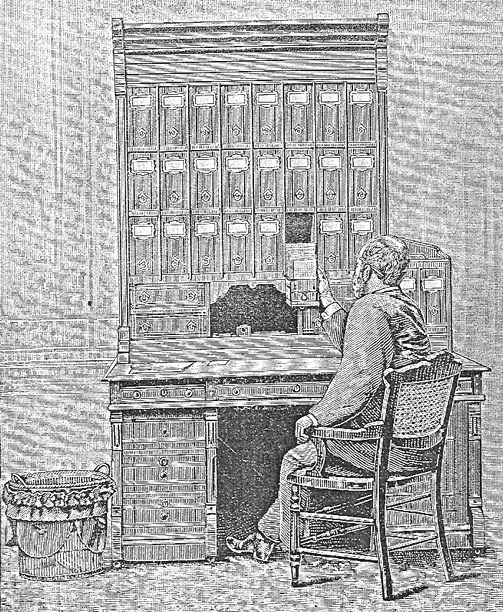 Office with Two Men at a Desk, G. L. Howe and O. M. Powers, The Secrets of Success in Business, 1883. 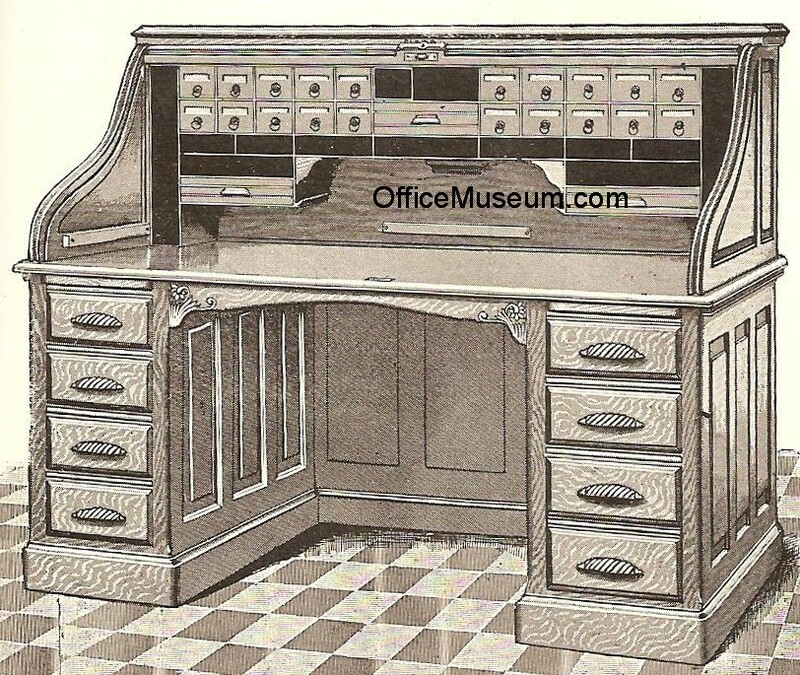 Wirts & Scholle Desks: The images in this row come from the 1885 Office Furniture Catalog of Wirts & Scholle, Chicago, IL. 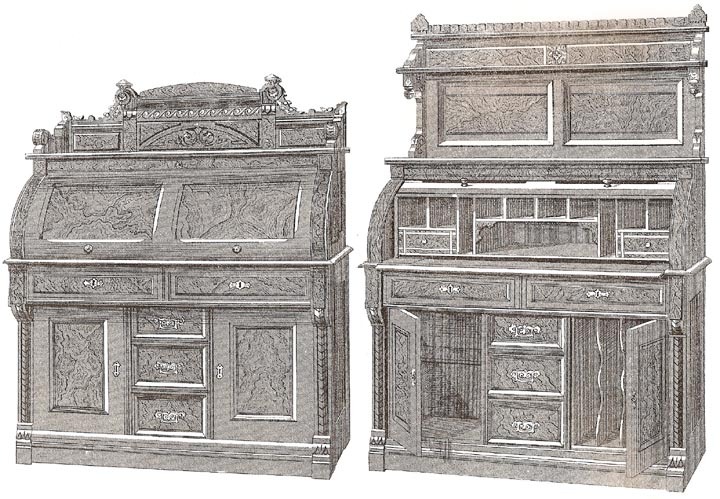 These desks incorporate elements from desks that were marketed in the 1840s-1880s. According to Yates (pp. 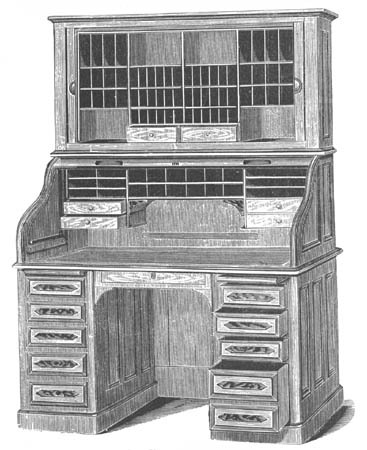 29-30), "The pigeonhole desk was expanded to its utmost extent in the Wooton Patent Desks....The desk catered to the one-man business....While it might handle the personal papers of such Wooton owners as John D. Rockefeller and Jay Gould, or the firm records of very small businesses, it could not begin to handle the external and internal correspondence and records of growing, systematically managed firms." 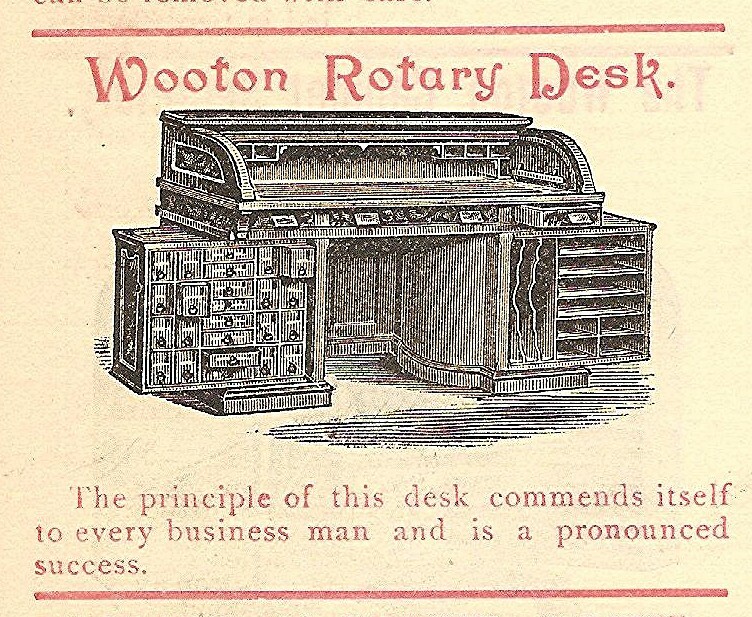 The Wooton Desk Mfg. Co. went out of business in 1884. 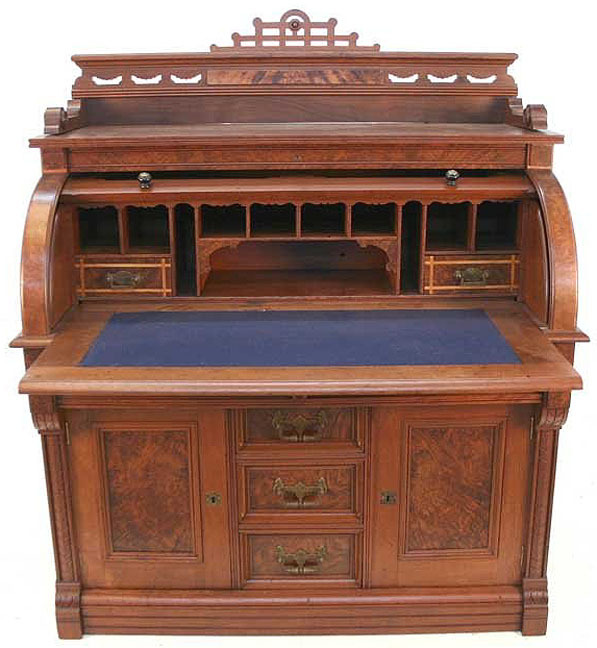 Other companies produced Wooton-style desks for a few additional years. 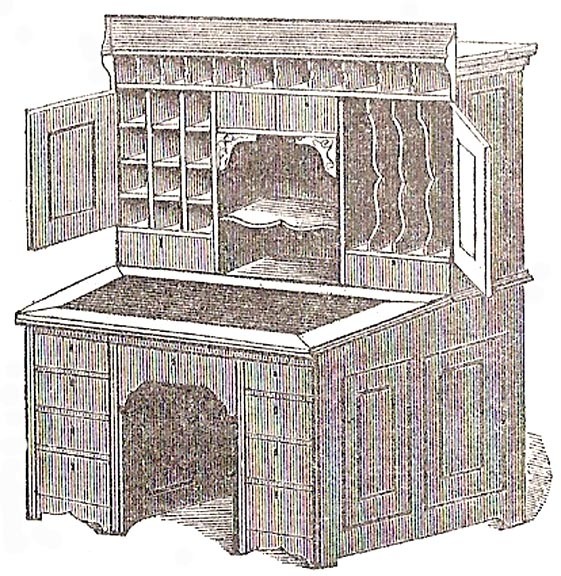 Wooton advertised this item during 1874-84 and probably later. 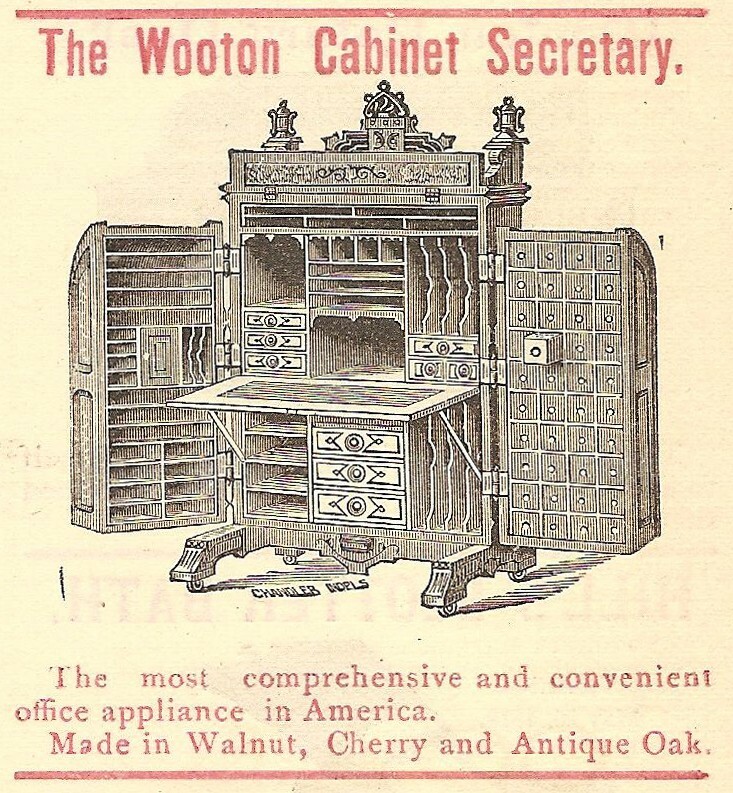 then Wooton Office Desk Co.
Wooton advertised this desk in 1882. 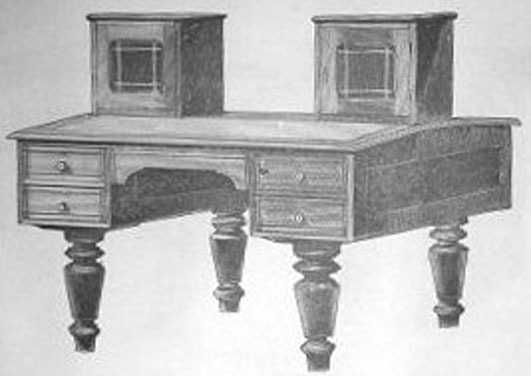 While Wooton desks had three sections, Moore desks had two sections. Photograph courtesy of Antiquarian Traders. 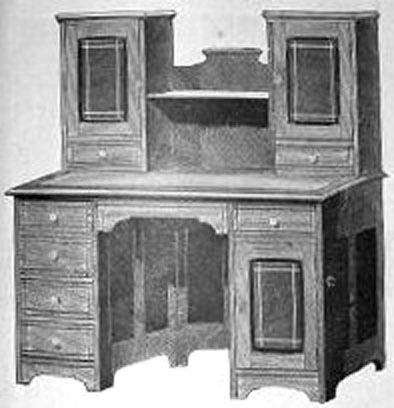 Moore combination desks were produced in standard, extra, and superior grades. Standard grade combination desks were $110 to $185. Extra grade desks were 40% to 50% more expensive. Superior were more expensive. On Mar. 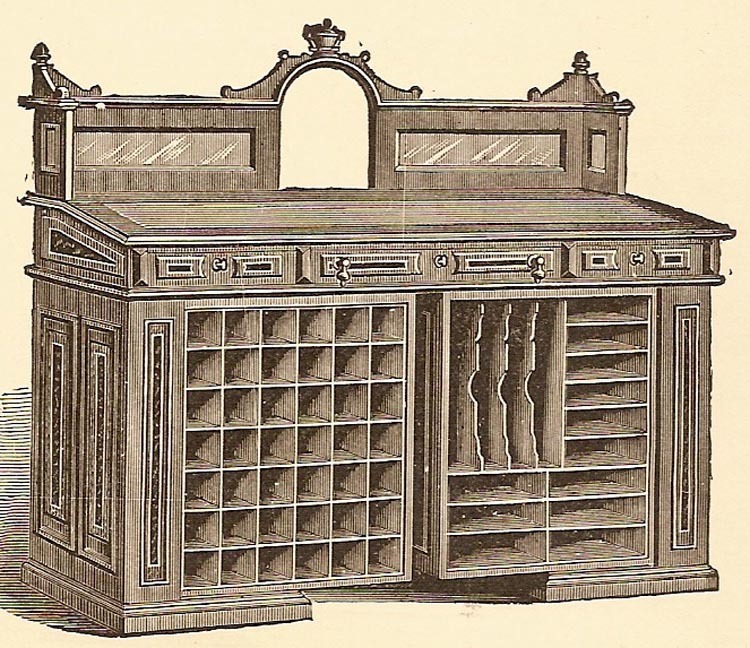 23, 1886, the president of the Indianapolis Cabinet Company, Indianapolis, IN, obtained US Patent No. 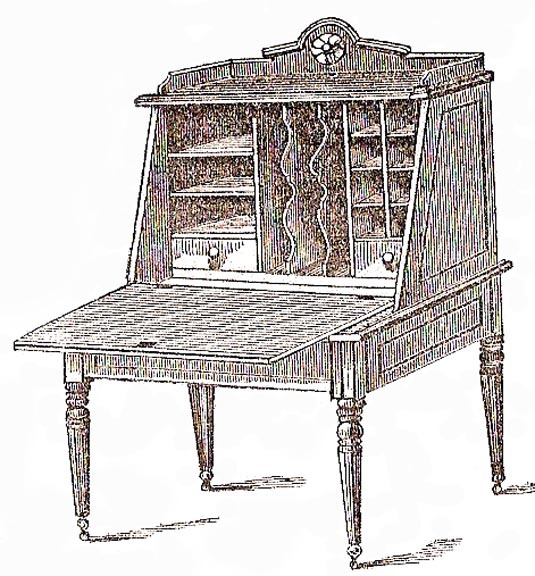 338,632 for a double-pedestal desk with two hinged Wooton-like sections that were attached to the upper part of the desk and that opened to the sides. The desks produced by this company probably did not fall in the luxury category, but they are included here because of their relationship to Wooton desks. The company went out of business in the early 1890s. 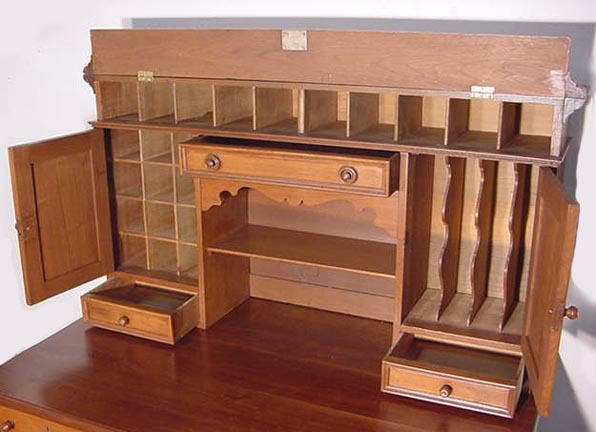 Standing or book-keepers' desks were sold from the1840s, if not earlier, until after 1900. The Secrets of Success in Business, 1883. Why did book-keepers stand while they worked? 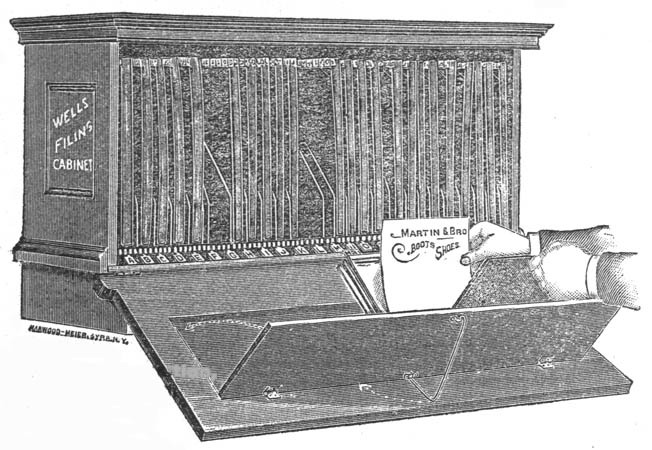 The shift toward use of loose-leaf ledgers and book-keeping machine that began in the late 1890s presumably reduced the use of standing desks. However, we have seen advertisements for standing desks as late as 1917. 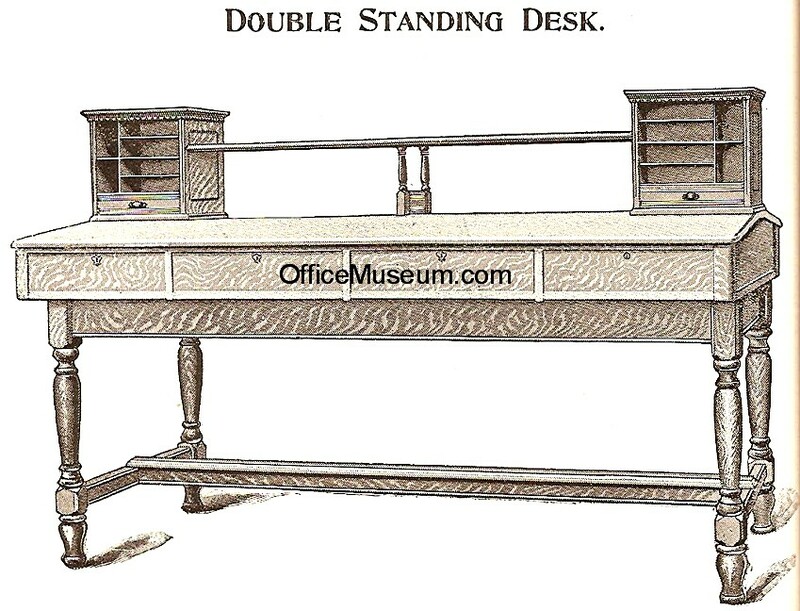 Double Standing Desk, The Globe Co., Cincinnati, OH, 1894/95 catalog. 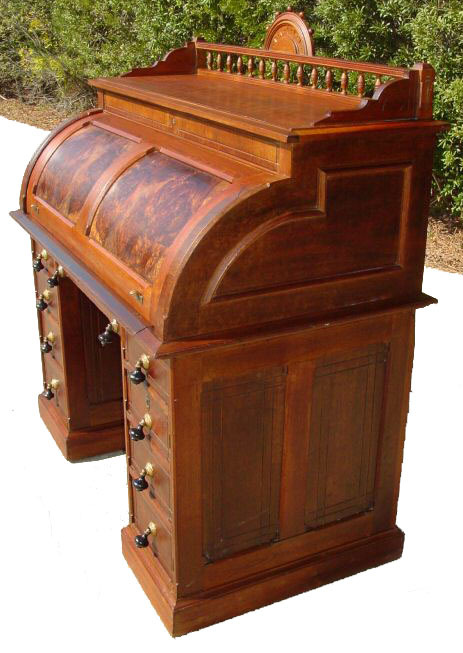 In the 1890s and first decade of the 20th century, roll-top desks were widely advertised. 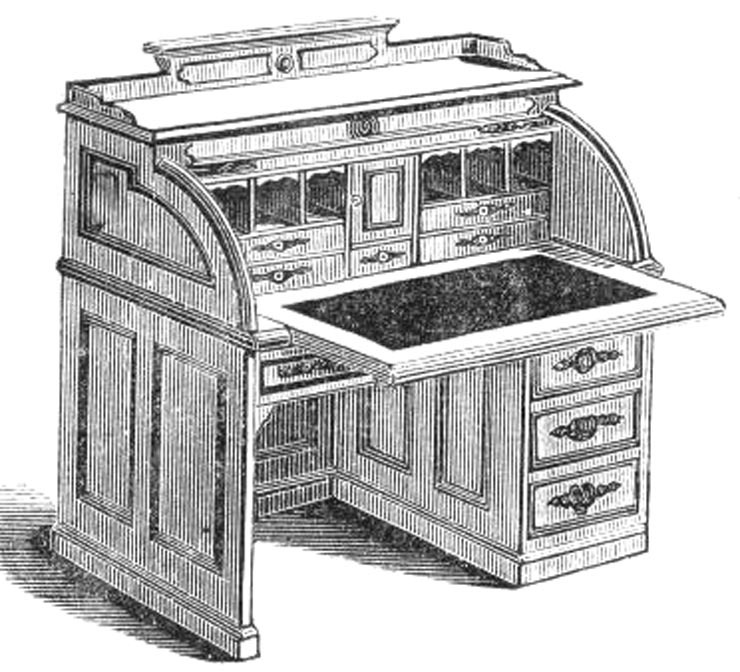 We have seen ads for traditional style roll-top desks as late as 1917. 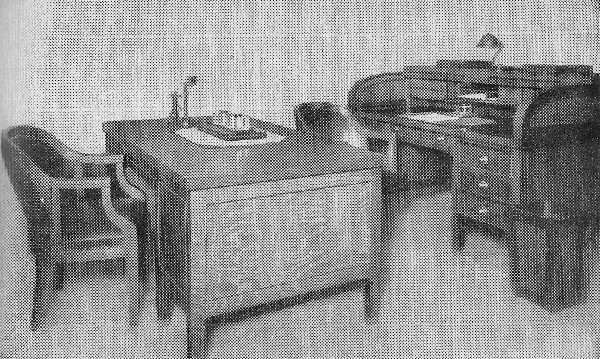 We have seen ads for "modern-style" roll-tops desks during 1909-28. Office with "modern" roll-top desk in background, 1918. 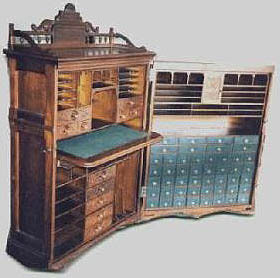 In a 1914 book on the American office, J. William Schulze states, perhaps as prescription as well as description: "The roll top desk is fast disappearing from efficiently managed offices, the chief objection being the fact that it becomes a receptacle for important papers which are forgotten. Also the pigeon holes frequently become filled with 'truck' which might as well be thrown away.... Most papers that are filed in the pigeon holes should be placed in the files where they are accessible to every one who needs them. Moreover, the unnecessary height of a roll top desk cuts off valuable light and air." 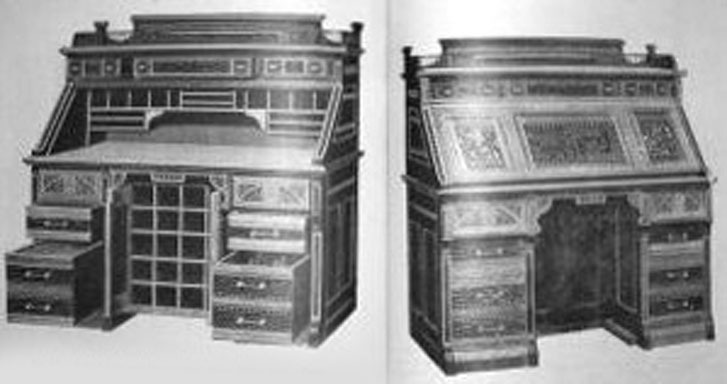 (The American Office, 2nd ed., Ronald Press, New York, NY, 1914) To the extent that the preceding comments are correct, they apply to all desks with high backs illustrated above that were popular in the second half of the nineteenth century and the first decade of the 20th century. © 2000-2016. 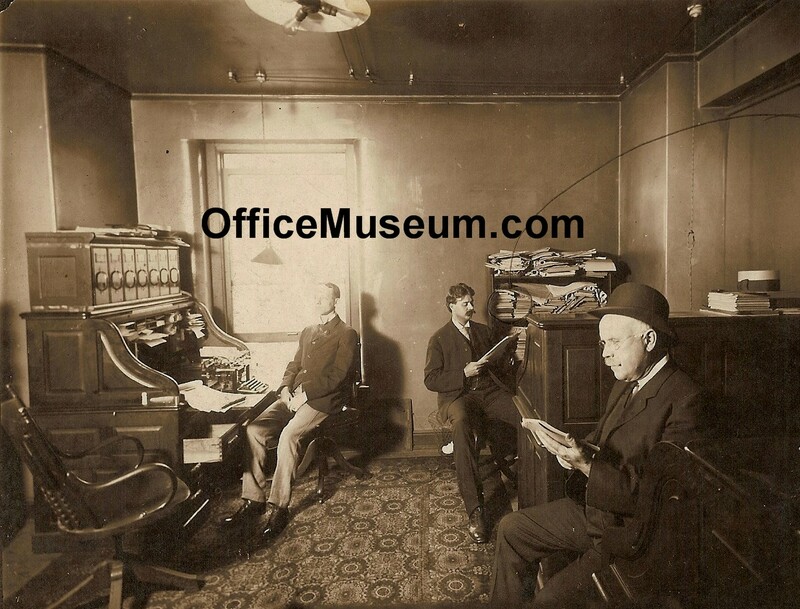 All material on the Early Office Museum web site is copyrighted. All rights are reserved. First, you must not plagiarize our material. Plagiarism is the act of passing off as your own the words, photographs, or other work of someone else. That is, not giving appropriate credit. Second, you must not violate our copyright, which means you may not use any images or text from the Early Office Museum web site in publications, in direct mailing material, on web sites, in auction listings, or anywhere else without written permission from the Curator. In some cases, images belong to someone else, and we cannot give permission. 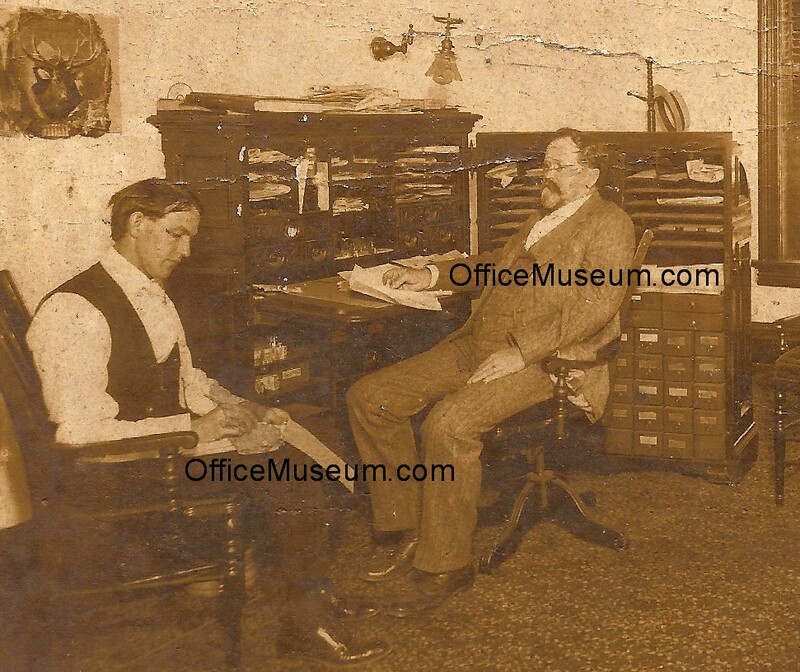 If you make a non-infringing use of information from this web site, please cite the Early Office Museum and provide a link or our web address (www.officemuseum.com or www.earlyofficemuseum.com). If you believe that we have not given appropriate credit for your work or have violated your copyright, please email the curator so we can resolve the matter.